Welcome to the Poseidon theme documentation. These instructions briefly explain how to setup and configure all theme features. Please be aware that the PRO Version of Poseidon is an Add-on plugin for the Poseidon theme. Therefore you have to install and activate the Poseidon theme and install the Poseidon Pro plugin in addition. You can learn how to install Plugins on the Install WordPress plugins tutorial. Poseidon supports the awesome Theme Customizer. You can configure all theme settings on your WordPress admin panel → Appearance → Customize on the “Theme Options” section. Choose the sidebar and post layouts. Configure the spacing of the logo and navigation menu. Choose between full posts and post excerpts. Deactivate date, author and other post meta information. Activate and configure the Post Slideshow. The Pro Version of Poseidon is an add-on plugin which you can purchase on the Poseidon Pro page. You can download Poseidon Pro on our downloads page. If you need help to install the plugin please visit our Install WordPress plugins tutorial. Poseidon Pro adds four widgetized footer areas. You can add your footer widgets on Appearance → Widgets. The main content column width is 840. The Featured Images displayed in the header on single posts and static pages are 1920x480. The Featured Images used on the Post Slideshow are 1920x480. The Featured Images used on post archives are 840x560 or 360x240 based on the chosen post layout. The Featured Images on the Magazine Posts Widgets are 600x400 (large), 360x240 (medium) and 120x80 (small). 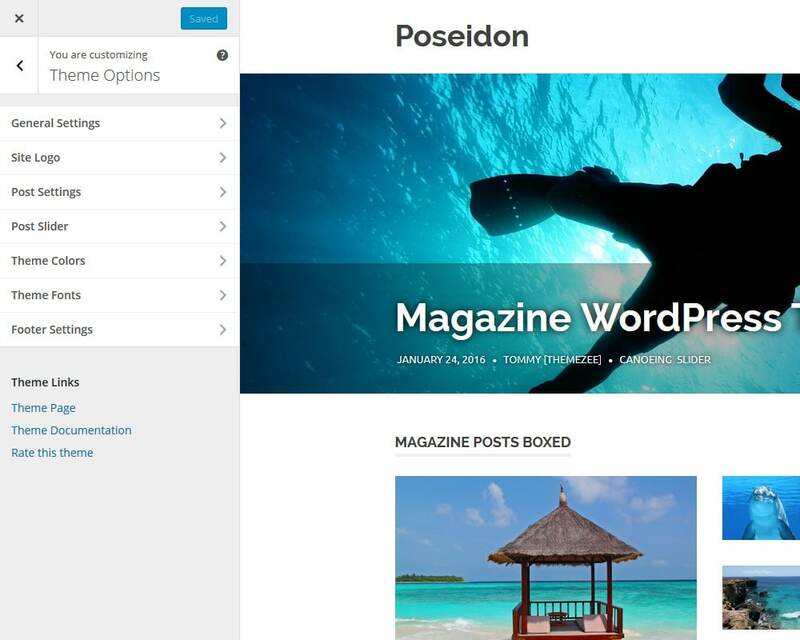 Thank you so much for using the Poseidon WordPress theme.